Sail for eight days aboard a classic riverboat from Siem Reap to Ho Chi Minh City. Experience Cambodia and Vietnam from a truly different perspective — the waters of the mighty Mekong River. 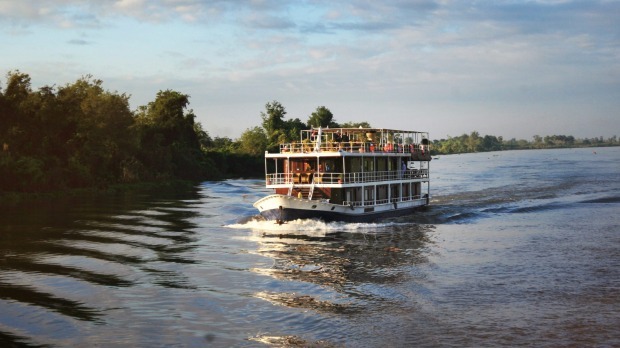 Sail for eight days aboard a classic riverboat from Siem Reap to Ho Chi Minh City. Discover Phnom Penh, roam the famous floating markets, and explore the stilt village of Chnok Tru. Incredible views of Southeast Asia await travellers here. Lunch at New Hope Vocational Training Restaurant in Siem Reap (A 'G for Good' experience), arrival transfer, 7 nights aboard the Toum Tiou II Riverboat, sunrise tour of Angkor Wat, Chnok Tru floating village visit, Kampong Chhnang visit, Vihara and pagoda visit (in Kampong Tralach), Koh Chen island visit including cottage industries, Cyclo tour (in Phnom Penh), Choeung Ek (Killing Fields) guided tour, Tuol Sleng Museum (S-21 Prison) guided tour, Apsara show, Tra Su Bird Sanctuary visit, Sam Mountain sunset visit, Kien An Cung Pagoda visit (Sa Dec), Vinh Long excursion, Vinh Trang Pagoda visit, Thoi Son Island cottage industries tour, options to cycle to excursions along the way, farewell cocktail and Captain's dinner, Cu Chi Tunnels guided visit, all transport to/from included activities and between destinations. Aboard the Toum Tiou II Riverboat (7 nights), hotels (2 nights).9 breakfasts, 4 lunches, 6 dinners. Reduced price: $A2271 for Upper Deck Twin (reduction of 20 per cent on April 19 departure).